This classically Georgian door ornament is a focal point for any door. 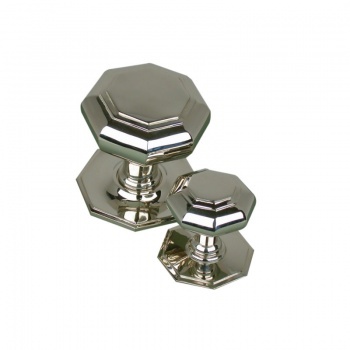 The larger version of the octagonal door centre pull is available in polished brass or nickel. The door pull is not lacquered and is supplied with the relevant fixings. Please note the larger version of this item is pictured with the small octagnonal door pull to illustrate the size difference only. Dimensions - Projection 113mm, Knob 110mm (points), 103 (flats), Rose 113mm (points), 105 (flats).